This hearty Kale Pomegranate Spelt Salad is super delicious and combines three of my favourite ingredients: whole spelt berries, shredded Dinosaur kale and pomegranate seeds. This week I saw the first Dinosaur kale or cavolo nero back in stores again. In Europe, you can often find cavolo nero in stores from July to Januari. The crisp sweet pomegranate seeds are the perfect addition to this salad, the freshness of the pomegranate seeds works really well with the chewy spelt berries and hearty, slightly bitter taste of kale. Spelt is high in protein and fiber and has a lovely nutty flavour and chewy bite. As many people have become sensitive to modern wheat, spelt has rapidly increased in popularity. As an ancient type of wheat, it has remained mostly unadulterated. Modern wheat is very different from the wheat of the early 20th Century. The wheat gluten in modern wheat has a completely altered chemical structure compared to ancient forms of wheat like spelt or kamut that have not been cross-bred and genetically altered. Research suggests that the altered chemical make-up of modern wheat gluten contributes to a higher prevalence of obesity and higher incidences of gluten sensitivity. There are two main groups of proteins in gluten, called the gliadins and the glutenins. Although spelt still contains a moderately high amount of gluten, it has a lower gliadin content. Research links the higher gliadin content of modern wheat with increased incidences of gluten sensitivity but also with weigh gain. Gliadin is said to stimulate appetite and, very much like sugar, it is highly addictive. For these reasons, whole spelt might be a better choice for you. Please note that if you have a gluten allergy or Coeliac’s disease, you need to stay away from spelt and use a gluten-free alternative like quinoa or amaranth instead. Rinse the spelt berries and soak overnight in twice the amount of water. To cook the spelt, bring spelt with the soaking water up to a boil in a medium-sized saucepan. Allow to simmer for 1 hour. Drain and set aside. Combine all ingredients in a small bowl for the maple-roasted pecans, and toss to coat. Preheat the oven to 180 degrees celsius. Line a baking tray with baking paper and spread the pecans out on the baking paper. Bake for around 10 minutes, keeping a close eye on them (they burn easily) and stirring every once in a while. Mix all dressing ingredients in a large salad bowl. Then, add the shredded kale and massage the dressing into the kale until buttery and soft. Add the drained spelt, apple, parsley and pomegranate seeds. Season with freshly ground black pepper and sea salt to taste. 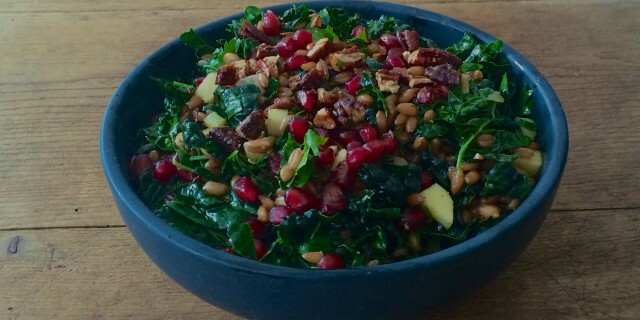 Enjoy your Kale Pomegranate Spelt Salad!